Function need no longer interrupt style in the kitchen. 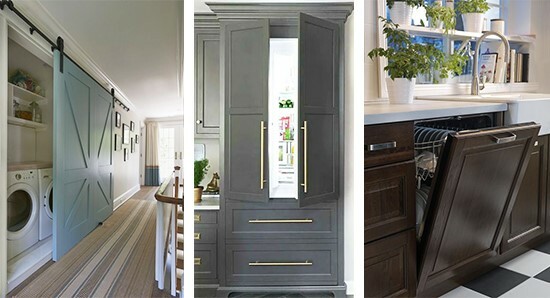 Necessary everyday appliances such as kettles, coffee machines, toasters, microwaves, and food processors can be cleverly tucked away with creative cabinetry solutions, and bigger appliances such as refrigerators and dishwashers can get built-in trim to match the kitchen’s overall cabinetry. The result is a seamless, sleek elegant space that answers the style brief just as well as it does the practical. Small appliances are difficult to co-ordinate, and they take up valuable counter space if left out. Storing them on traditional shelves inside cabinetry makes it cumbersome to remove and pack them away. However, there are solutions – see some unique ideas below. One of the hottest trends in kitchen design is to integrate large appliances into the kitchen cabinetry, allowing them to be completely camouflaged. If space permits, creating a sectioned off space for these bulky appliances is an option, alternatively having them trimmed in the same cabinetry effectively makes them disappear until needed.